You keep a bullet journal calendar, future log, trackers, and dailies…but can a bullet journal be a diary? 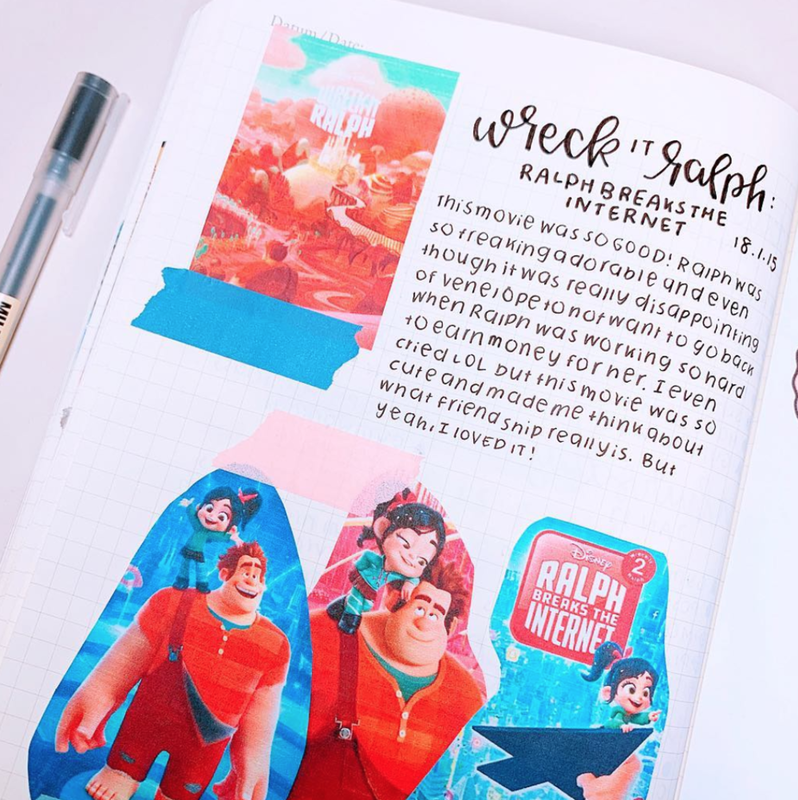 Yes, you can use your bullet journal as a diary! That’s the beauty of a bujo, it allows you to write anything you want whenever you want. I started using my bullet journal as a diary as well, so I researched layout ideas and what to write in the diary portion. Bullet journals are a method of logging all of your information in one place while using the index pages to keep it all organized. The next page of your bullet journal is your’s to decide. Do you want to make a list of movies to watch, make a plan to learn how to juggle, or keep a diary - it’s up to you! In a regular diary, pages are dated and predetermined. However, some days you have a lot to write about, other days not much…or even nothing to record. When I miss a page (or pages) in my diary, I get down on myself for not filling in that day. Other times, I have so much to say, that one page is not nearly enough! #1. Use a blank notebook as a diary and log pages as you go. You can fill up five pages or a half-page. However, if you are a ONE BOOK lover like me, you want want to keep track of a planner and also a diary. #2. Here’s where the Bullet Journal works it’s magic! 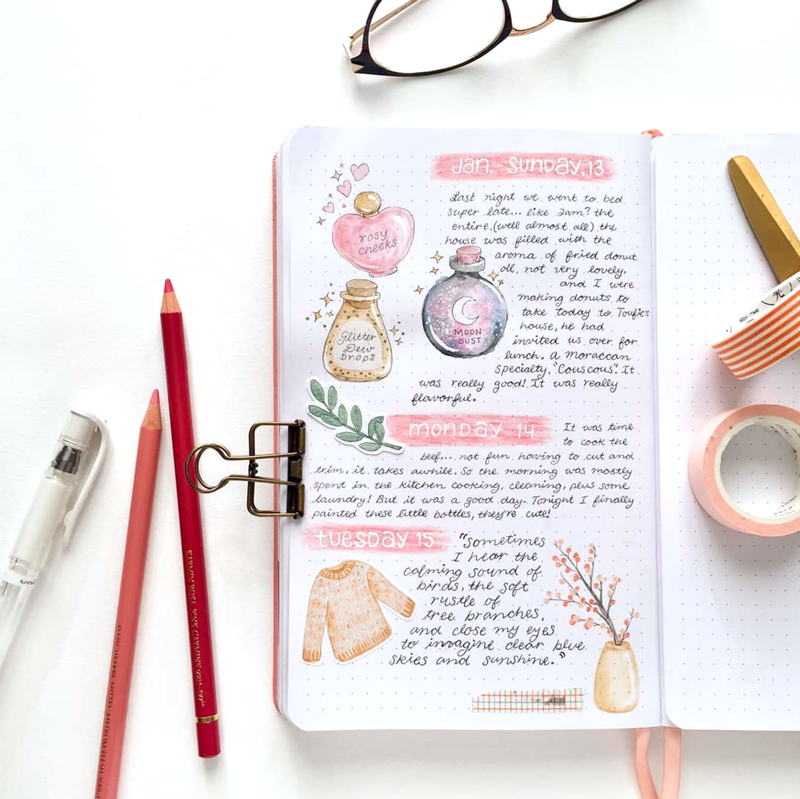 By using a bullet journal as a diary, you’ll be able to keep all of the things going on in your life while having a special place to write. You will no longer have wasted pages because you’ve assigned them a task ahead of time. With a bullet journal, you don’t plan the pages ahead. Set realistic goals. Most people start out saying, I’m going to journal EVERY day and never miss. Then, the first day they miss, the bubble is burst and they feel deflated and quit. By setting a small, achievable goal such as once or twice a week you are setting yourself up for success. If you are busy and happen to miss a day, don’t beat yourself up about, just journal the next time you have time. The goal of a diary is to allow you to freely write your thoughts. Don’t edit and don’t try to impress anyone. This is something you are doing for yourself not for anyone else. Take away distractions when you write. Find a quiet space, turn off the TV and the cell phone, and allow yourself to be in the moment. Let your mind wander for a few minutes before you begin writing. There’s no right or wrong to what goes on those pages, they are a free flow of your mind. The way we talk to ourselves has an impact on our lives. According to Gregory L. Jantz, Ph. D. at Psychology Today, we have an inner dialog that plays over and over in our minds. By writing down the negative thoughts in our minds and then counteracting them with positive truths, it allows you to change your self-talk and discover the optimism, hope, and joy in any situation. You can write about your day or week, but if you feel like that is getting boring and not inspiring you to write, change it up so that you look forward to journaling. Here are some additional ideas to write in your diary. 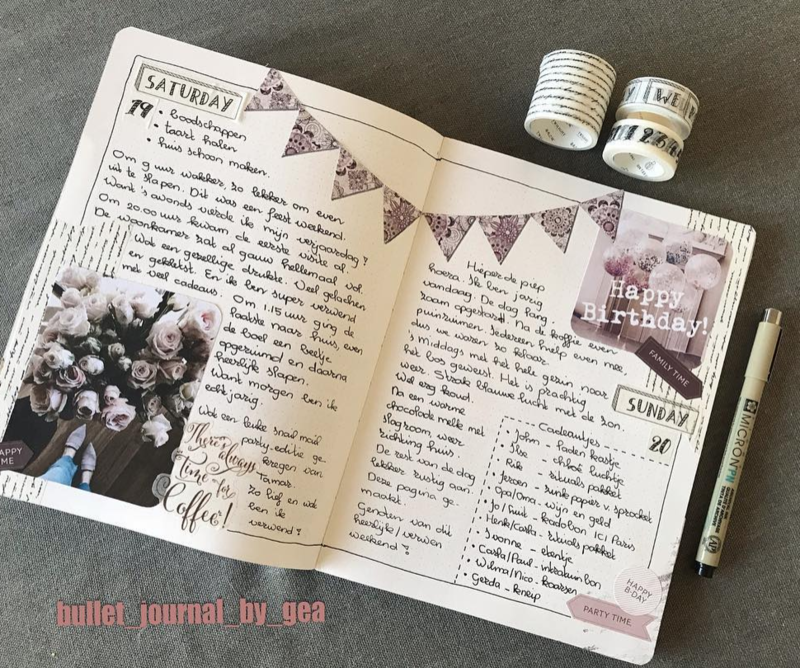 I looked at so many diary pages when writing this post and I noticed a lot people decorate their pages in addition to writing - this is something I really enjoy doing as well. It allows me to be creative as well as spend time thinking about the entry I just wrote about. However, don’t think that your pages HAVE to be decorated! If you want to just write and that’s all - then leave it as is. But if you finish writing and feel like you want more time on the page, by all means, break out the washi tape, colored pencils, markers, and stickers and have fun with it. Short diary entries on bullet journal pages are decorated with stickers, washi tape and colored pencils. Dedicate on page per day in your bullet journal for diary entries. You can fill the entire page with writing or add photos and stickers to personalize it. Keep track of important life events. You can write about your feelings about the event, add photos and turn it into a memory you’ll have for a lifetime. When writing in a diary, log your feeling on a subject - it could even be a movie (as shown, above). Add favorite quotes to your diary pages for extra impact. 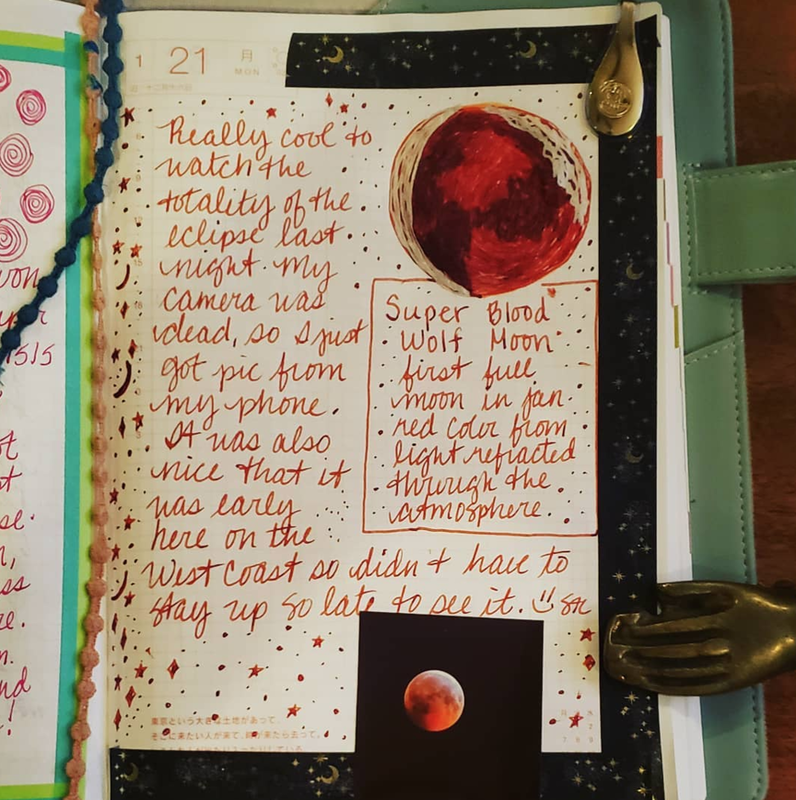 Are you going to add diary entries to your bullet journal? Let me know why or why not in the comments below!